The second generation of the GMC Terrain mini hybrid sees a few technology upgrades, package tweaks, and exterior style flourishes. The Chrome Accent Package will be replaced by a Bright Accent Package, and GMC is doing away with the Mineral Metallic and LPO/accessory-level Black Accent Package, They will add a new color, Smokey Quartz Metallic, and several new style upgrades to various trim levels. On the tech side, the Terrain will gain Adaptive Cruise Control with Stop/Go and Front Pedestrian Braking capabilities. These features will also be added to the Driver Alert Package II. Both the rear vision and surround vision cameras will be upgraded to HD models, also replacing the camera systems in the Infotainment and Advanced Safety packages. The 4.2-inch multi-color driver information screen is now a standard feature in the SLE and SLE Diesel trim levels, and wireless charging is now a standard feature on the Denali. 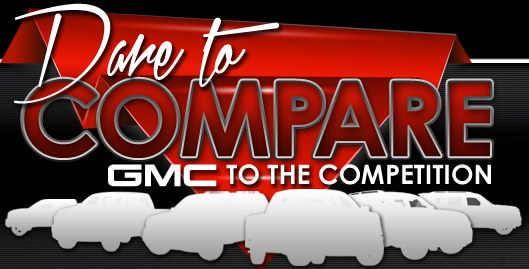 Which Trims and Features has GMC Made for 2019? 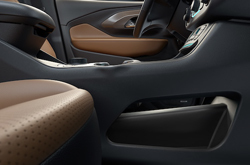 The Terrain is available in six trim levels, with 11 configurations. All trim levels seat five passengers and have front-wheel drive, and all trims after the SL also offer an all-wheel drive option. The basic SL model gets 28 mpg combined and offers a choice of a 9-speed manual transmission with OD or auto-manual. Terrain SLE and SLT differ from the SL mainly by the addition of an all-wheel drive option, a wider range of exterior colors, and variety of packages and optional features. The Terrain SLE is also available in a diesel trim with less powerful engine, a 6-speed automatic w/OD or auto-manual transmission, and a combined mpg of 32. When you choose the Denali, you're getting premium everything standard, a powerful engine, and high quality upgrades. Wireless charging; 4.2-inch multi-color driver information screen; and audio, phone, and navigation capability are now standard features on the Denali. They are available as options in the Infotainment Package on all other trims. How Much Power does the 2019 GMC Terrain Have? 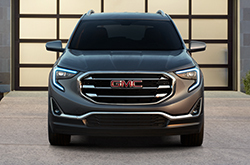 GMC Terrain engines range from the 137-horsepower diesel to the 170-horsepower standard SL and SLE on up to the 252 horses under the hood of the Terrain, and all engines have a turbocharger upgrade available. In fact, these vehicles are the only ones in their class to combine a turbocharged engine with a 9 speed transmission. Feel free to stop by and take one of these for a test drive. 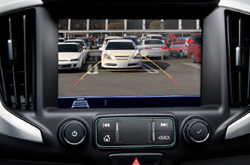 All Terrain models offer some of the latest driver safety technology as standard features. You'll also enjoy some high-tech upgrades that are available as stand-alone options or as part of a driver safety package. Two of these features are the Lane Change Alert with Side Blind Zone Alert to help you change lanes safely, and the Lane Keep Assist with Lane Departure Warning to keep you from drifting. Both are invaluable aids for those who do a lot of driving or on long trips. Standard driver and passenger safety equipment includes dual-stage frontal, side thorax, roof-rail side-impact, and front and rear outboard airbags; a child/passenger front seat sensor inflatable restraint, and child/passenger front passenger detector.